Cortex: Thin (2 mm) alluvial neo-cortex, pale yellowish brown, transition sharp with a finely crenulated boundary. Colour: Brown with yellowish brown streaks (10YR 5/3.5). Pattern: Alignments of yellowish brown or pale tan specks, a few light millimetric inclusions. Grains: 5 to 10 %, pale or stained by iron oxides, rounded with high sphericity (50 to 100 µ); micritized clasts (500 to 2000 µ). Grain composition: Highly fragmented thin-walled sponge spicules, rare small globose and biserial foraminifera; iron oxides. Other types of flint: Apart from the CN3b-flint described here, also several other flint-types of Senonian age can be found here: CN2a, CN2c, CN3a, and CN4c, as well as Early Cretaceous Ht3 silex. Geographical description: The sampling site lies in a small wooded valley half a kilometre to the south of the hamlet of Confranchette d'en Bas, which can be reached by following a narrow road for about a kilometre towards the southwest from St-Martin-du-Mont. Co-ordinate precision: The location was documented on a large-scale topographical map, from which the French coordinates were taken. The latitude/longitude coordinates are a direct transformation of these data on WGS84 and rounded to the nearest arc-second. Geology: The flint lies reworked in glacial deposits of Würmian age, unit "a" on the local geological map. Other types of flint: Besides the CN3b-type, also the CN2a variety as well as CN2c flint can be found here. 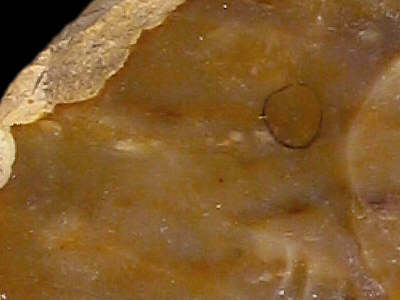 All flints originate in Late Cretaceous limestones, but were transported during the last Ice Age to their current position.